Have you always dreamed of having a new home with stunning ocean and mountain views on the west coast of Vancouver Island? 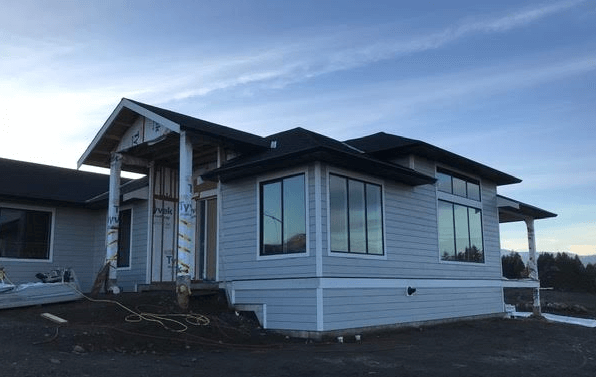 Our newest custom designed home will be completed and ready for occupancy in April of 2019. This beautiful rancher/bungalow style home is perfect for entertaining family and friends. The open concept design features a 12-foot high ceiling in the living room which is open to the dining room and kitchen. Large windows and french doors surround this great room area. The focal point of this contemporary home is the see-through indoor/outdoor luxury gas fireplace extending the living space to enjoy the outdoors from inside of the home. The large deck with glass panels is accessible from the great room and you are only steps away from cozying up to the outdoor fireplace while enjoying unobstructed views of Comox Bay and surrounding mountains. The outside deck has been wired for Bluetooth compatibility so you can listen to your favourite playlist from the outside speakers. This 2,010 sq. ft. home, designed in a transitional style, includes 3 bedrooms and 2.5 baths. Built for versatility, the bedrooms can also be used as an office space, a den, video room or for your own exercise area. The modern two-tone kitchen includes custom cabinetry finished in “cloud white” and “ebony” with quartz counter-tops, a gorgeous large island with a seating area and high-end light fixtures. The wide plank engineered hardwood flooring in white oak combined with the contemporary colour palette completes the elegant, clean look in the kitchen and great room. The master bedroom has a luxurious ensuite with double sinks and a large walk-in rain shower. This new home for sale is located at 4166 Chancellor Crescent at The Ridge in Courtenay, B.C. Contact us for a personal tour.